Question: How long has Bigsby been around? Answer: P.A. Bigsby started manufacturing musical instruments in the 1940s in Downey, CA. More information on the early days of Bigsby can be found in the new book: Paul Bigsby; Father of the Modern Electric Solidbody by Andy Babiuk. Answer: Many including: Gibson, Fender, ESP, Taylor and Paul Reed Smith. 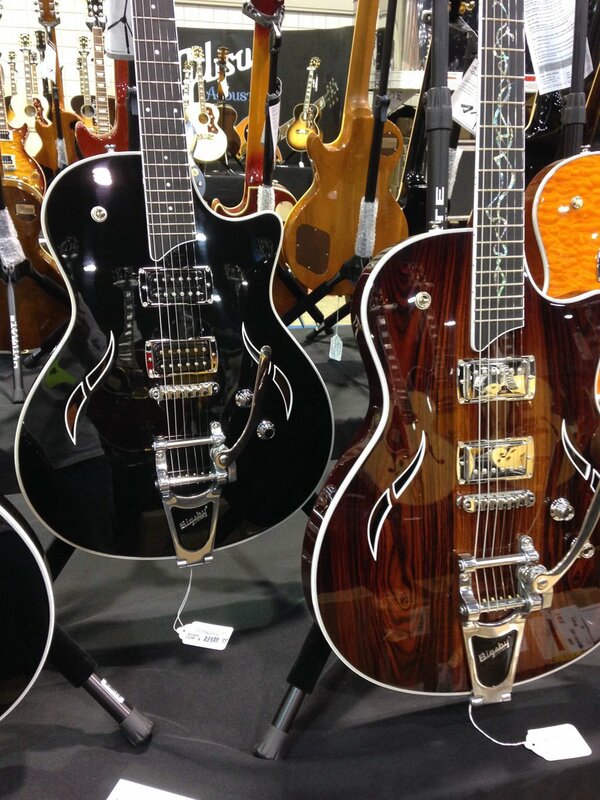 However, it is Gretsch guitars that are most often associated with Bigsby Vibratos. Question: Which Bigsby Vibrato will fit my guitar? 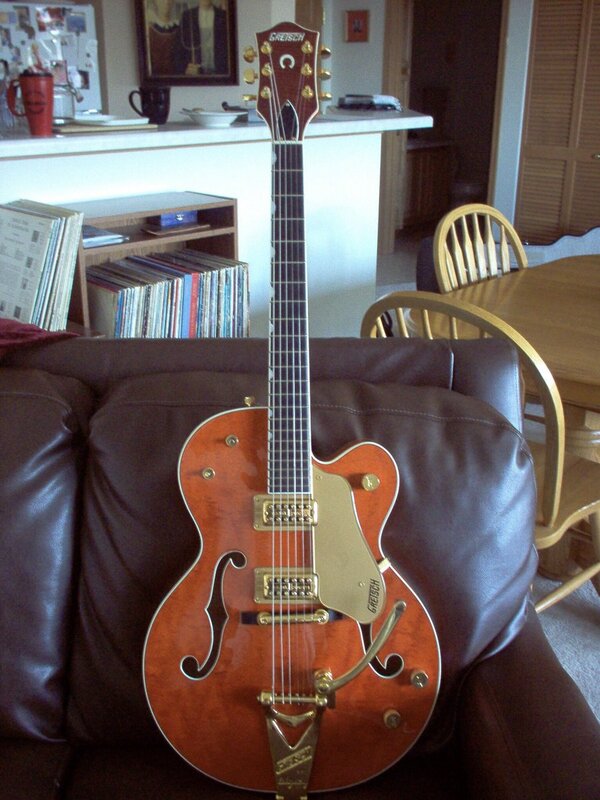 Question: Do I have to modify my guitar to add a Bigsby? Answer: Yes; slightly. Some models attach via a hinge that onto the back side of the guitar and other models use a combination of the hinge and screws into the guitar top.  Check out these videos for different installation processes. Question: Can I install a Bigsby? Answer: Yes; if you are comfortable using basic hand tools including a screwdriver and drill. All vibratos come with detailed installation instructions. If you prefer, visit your local guitar tech service location for installation. Question: How do you re-string a Bigsby equipped guitar? Crimp the string at a 45° angle next to the ball end (A). Feed the string underneath, around and over the axle (B). Place the ball end of the string onto the axle pin (C), keeping tension on the string to hold the ball in place. Push a foam wedge (D) into the space under the axle to keep the string in place on the pin while winding. Wind the string onto the tuning machine, tune to pitch and remove the foam wedge. Question: What can you tell me about the historical patent markings that appear on some of your products? 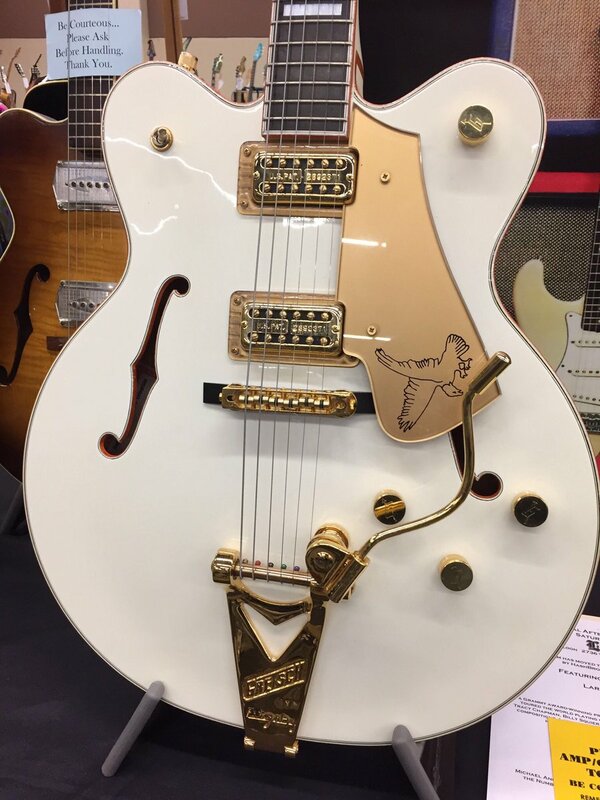 Answer: The Gretsch Company is proud to offer the Bigsby True Vibrato tailpiece, the first successful design of what is now called a whammy bar or tremolo arm. 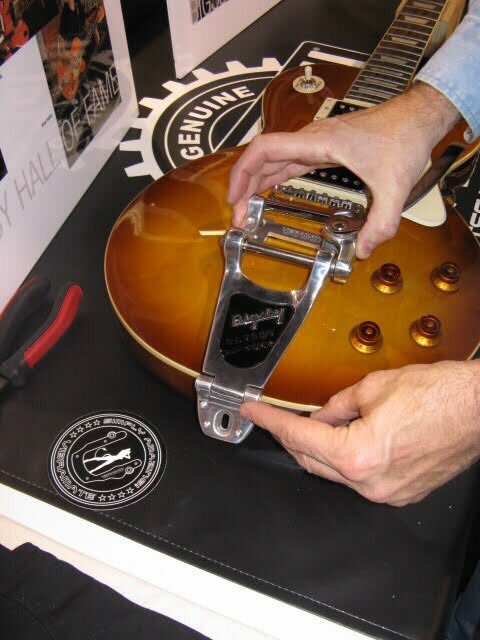 Created in the 1940s by inventor Paul A. Bigsby, Bigsby Vibrato tailpieces continue to be made today using original designs, molds, and methods, and, therefore, incorporate markings or text associated with patents that have since expired. Such markings are included only for the sake of historical accuracy, and are not intended to denote or imply live patents or ongoing patent protection. Question: Where can I purchase Bigsby vibratos? Answer: Bigsby Vibratos are available from most fine retailers of Guitars and Guitar Accessories. Check your local Music Store or search online. Question: Can I order direct off of this website? Answer: At this time we do not sell direct. See above question.